In this second part we will continue that discovery. We will also consider the meanings behind some of the language used in this prophecy, and whether or not there is meant to be any gap at all between the 69th and 70th weeks. Some Preterists believe that the “end to sacrifice and offering” took place in another sense when the temple (the place of sacrifices and offerings) was destroyed in 70 AD. Tertullian (160-220 AD), for example, writing about Jerusalem’s destruction, said, “Therefore, when these times also were completed, and the Jews subdued, there afterwards ceased in that place ‘libations and sacrifices,’ which thenceforward have not been able to be in that place celebrated [because the temple is gone]” (An Answer to the Jews, Chapter VIII—Of Jerusalem’s Destruction). For [Daniel] then said, Christ shall confirm the covenant with many for one week, and shall cause the sacrifices and oblation to cease. Afterwards, the abomination that stupifieth shall be added, and desolation or stupor, and then death will distill, says he, upon the astonished or stupefied one. The angel, therefore, there treats of the perpetual devastation of the Temple. So in this passage, without doubt, he treats of the period after the destruction of the Temple; there could be no hope of restoration, as the law with all its ceremonies would then arrive at its termination. With this view Christ quotes this passage in Matthew 24, while he admonishes his hearers diligently to attend to it… Without the slightest doubt, this prophecy was fulfilled when the city was captured and overthrown, and the temple utterly destroyed by Titus the son of Vespasian. This satisfactorily explains the events here predicted (Todd Dennis , 2009). 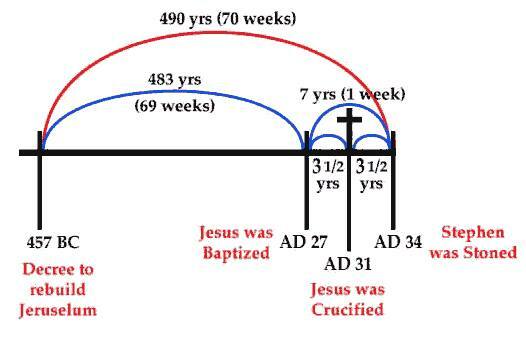 Any gap then, according to this view, was not a 2000-year gap between weeks 69 and 70, but a roughly 37-year gap between Christ’s ascension and the 3.5 year period of great tribulation leading up to Jerusalem’s destruction in 70 AD (spoken of in verse 26b and 27b). This is said to have been foreseen in Isaiah 61:2, especially as Jesus chose to quote it in Luke 4:18-19. On the surface there seems to be no gap in Isaiah’s statement, but Jesus alluded to one when He stopped after stating that He had come to “proclaim the year of the Lord’s favor.” The part He didn’t quote then (“and the day of vengeance of our God”) He later referred to at the end of His ministry when He predicted the destruction of Jerusalem: “But when you see Jerusalem surrounded by armies, then know that its desolation has come near…for these are days of vengeance, to fulfill all that is written…For there will be great distress upon the earth and wrath against this people…” (Luke 21:20-24). The nearly 40-year gap then served the purpose of giving Israel a generation within which to repent. In this way Isaiah 61:2 and Daniel 9:27 refer to the same two time periods, separated by the same gap, i.e. the acceptable year of the Lord (the 3.5 year-ministry of Jesus) and the day of vengeance (the 3.5 year-siege on Jerusalem leading up to its destruction, what Jesus called “great tribulation” in Matthew 24:21). Therefore, the first half of the 70th week (3.5 years) established the New Covenant, and the second half of the 70th week (3.5 years) a generation later confirmed the New Covenant by completely abolishing the Old Covenant temple system. The kingdom of God, already established in heaven when Jesus ascended and being lived out among those who followed Christ, was then fully established on earth and given to the saints (Daniel 7:27). It was taken from national Israel and given to the Church, the people whom Jesus said would produce its fruits (See the ‘Parable of the Tenants’ in Matthew 21:33-45). I have no hesitation in referring this language of the angel to that profanation of the Temple which happened after the manifestation of Christ, when sacrifices ceased, and the shadows of the law were abolished. From the time, therefore, at which the sacrifice really ceased to be offered; this refers to the period at which Christ by his advent should abolish the shadows of the law, thus making all offering of sacrifices to God totally valueless… God’s wrath followed the profanation of the Temple. The Jews never anticipated the final cessation of their ceremonies, and always boasted in their peculiar external worship, and unless God had openly demonstrated it before their eyes, they would never have renounced their sacrifices and rites as mere shadowy representations. Hence Jerusalem and their Temple were exposed to the vengeance of the Gentiles. The first half of the “week”, the time of our Lord’s ministry, was definitely directed toward ISRAEL. But what about the second half—the final three and a half years of the prophecy—was it also linked with Israel? Did the disciples continue to preach for the duration of the remaining three and a half years (as Christ’s representatives) especially to Daniel’s people—to Israel? Yes, they did! Jesus had told the disciples to go into all the world and preach the gospel to every creature (Mk. 16:15; Mt.28:19; Acts 1:8), YET—and this is significant—after Christ ascended, the disciples still at first preached only to Israel! Why? We know of only one prophecy which would indicate that this was to be the course followed. It is the prophecy of the 70 weeks which implied that after the death of Messiah there would still be three and a half years that pertained to Israel! Bearing this in mind, we can now understand at least one reason why the gospel went “to the Jew first” and then later to the Gentiles (Rom. 1:16). Peter preached shortly after Pentecost: “Ye are the children of the prophets, and of the covenant… unto you first God, having raised up his Son Jesus, sent him to bless you, in turning away every one of you from his iniquities” (Acts 3:25, 26). “It was necessary that the word of God should first have been spoken to you” (Acts 13:46). In person, Christ came to Israel during the first half of the “week”—three and a half years. Through the disciples—for the three and a half years that remained—his message still went to Israel, “the Lord working with them, and confirming the word with signs following” (Mk. 16:20). In a very real sense of the word, the ministry of the disciples was a continuation of the ministry of Christ.Then came the conversion of Cornelius which completely changed the missionary outreach, outlook, and ministry of the church. Though the New Testament does not give an exact date when this happened, apparently the time for special exclusive blessing upon Daniel’s people had drawn to a close. The gospel which had gone first to the Jews was now to take its full mission—to be preached to all people of all nations! This time of changeover was marked by a number of supernatural events. Cornelius received a heavenly visitation. An angel appeared to him and told him to call for Peter “who shall tell thee words whereby thou and all thy house shall be saved” (Acts 11:14). God showed Peter a vision which caused him to know that the gospel was now to go to the Gentiles and not to Israelites only. All of these things were timed perfectly—showing that God’s hand was accomplishing a definite purpose. Returning to Jerusalem, Peter explained what had happened. “When they heard these things, they fell silent. And they glorified God, saying, ‘Then hath God also to the Gentiles granted repentance unto life’ “(Acts 11:18). Zev Vilnay (1973) tells of a Jewish tradition supporting the truth that Christ’s death made the Jewish sacrificial system invalid. Under Mosaic Law a scapegoat, symbolically carrying Israel’s sin, would be driven out into the wilderness on the Day of Atonement, at which time a crimson wool thread tied to the temple would supernaturally turn white. During the last 40 years of the temple’s existence, however, according to numerous Jewish sources, this thread never turned white (pp. 115-116). If this tradition is true, it demonstrates the truth that from the time of Jesus’ death the sacrifices and offerings of the temple did nothing to atone for Israel’s sin. Origen (185-254 AD): “The weeks of years, also, which the prophet Daniel had predicted, extending to the leadership of Christ, have been fulfilled.”  Eusebius (314 AD): “When the captivity of the Jewish people at Babylon was near its end, the Archangel Gabriel [told Daniel that Jerusalem would] be destroyed, and that after the second capture and siege it will no longer have God for its guardian, but will remain desolate, with the worship of the Mosaic Law taken away from it, and another new Covenant with humanity introduced in its place… ‘For ending disobedience, and for completing transgression [Daniel 9:24].’ I think that our Saviour’s words to the Jews, ‘Ye have filled up the measure of your fathers [Matthew 23:32],’ are parallel to this… [T]here follows the prophecy of the new Covenant announced by our Saviour. So when all the intermediate matter between the seven and the sixty-two weeks is finished, there is added, ‘And he will confirm a Covenant with many one week,’ and in half the week the sacrifice and the libation shall be taken away, and on the Holy Place shall come the abomination of desolation, and until the fullness of time fullness shall be given to the desolation. Let us consider how this was fulfilled.”  Augustine (354-430 AD): “Daniel’s weeks…had to be completed afterwards in the end of all things, for Luke most plainly testifies that the prophecy of Daniel was accomplished at the time when Jerusalem was overthrown.”  Theodoret (430 AD): “And so [begins] the last [70th] week at the baptism of Christ.”  William Hales (1747-1831): “During this one week, which ended about A.D. 34 (about the martyrdom of Stephen,) a new covenant was established with many of the Jews, of every class; in the midst of which the Temple sacrifice was virtually abrogated by the all-sufficient sacrifice of the Lamb of God that taketh away the sins of the [repentant and believing] world” (Todd Dennis , 2009). Sam Storms, Meredith Kline, and others believe that the final week is not a literal seven years. The first half, they say, extends from Christ’s ascension until the destruction of Jerusalem in 70 AD. The second half extends from 70 AD until Christ’s Second Coming. This is based in part by combining Daniel’s prophecy with the details in the sign of the woman and dragon in Revelation 12:5-6. Regarding verses 26 and 27, Sam Storms (2006) makes the helpful point that they “are not relating events that are sequential (i.e., A B C D) but rather parallel (i.e., A B A B).” In other words, Christ is spoken of in the beginning of verse 26 and again in the beginning of verse 27 (Sam Storms affirms that the “he” there speaks of Christ). Likewise, the Roman Empire, which presided over Jerusalem’s destruction in 70 AD, is spoken of in the latter parts of both verse 26 and 27. The Dispensational view is that 70 AD is spoken of in verse 26b, but that the world has not yet seen the desolations spoken of in verse 27b. Philip was only one of many who were scattered throughout Judea and Samaria, preaching the word, as a result of the great persecution which arose the day Stephen was stoned to death (Acts 8:1-5). This viewpoint sees the 490 years as literal and without interruption, after which (unlike in typical Dispensationalist thought) the Israelites would cease to be God’s chosen people. Instead, Jews and Gentiles alike could only be saved on an individual basis, making up the Church in which there is no Jew or Gentile (Galatians 3:28; cf. Acts 10:45, 11:18, 13:46, 14:27, 15:9, 18:6, 22:20-22). (1) Ezra 1:1-14, 1st year of Cyrus, dated to 537 B.C. (2) Ezra 6:1-12, 2nd year of Darius dated to 520 B.C. (3) Ezra 7:1-27, 7th year of Artaxerxes dated to 457 B.C. (4) Neh 2:1-8, 20th year of Artaxerxes dated to 444 B.C. Ezra 1 537 B.C. 54 B.C. 47 B.C. Ezra 6 520 B.C. 37 B.C. 30 B.C. Ezra 7 457 B.C. 27 A.D. 34 A.D.
Neh 2 444 B.C. 40 A.D. 47 A.D. The chart above, illustrating the no-gap viewpoint, is not mine. I found it online and copied it into my paper. In doing so, I accidentally neglected to note the source of this chart. If anyone happens to know the source, please let me know and I will give credit where due. The chart in its present form is a cropped photograph because it wouldn’t transfer from my word document into this web page. In this post, I covered two views of Daniel’s 70th week which are typical of preterists:  that there is no gap at all, meaning that the final week (seven years) comprises of the 3.5 years of Christ’s incarnational ministry, plus the next 3.5 years after His resurrection  that the first 3.5 years of this week were fulfilled in Christ’s incarnational ministry, but that there was a one-generation gap before the final 3.5 years were fulfilled during the Roman-Jewish War of 67-70 AD leading up to the destruction of Jerusalem and the Second Temple. “I subscribe to the last view – sort of. Christ’s forgiveness from the cross postponed the destruction. The four angels were told to wait. I wondered if you would take a look at this and let me know what you think.It is written by Steve Robertson – someone who’s helped me a great deal with issues concerning the second bodily Advent of Christ and the physical/bodily resurrection of the dead. I hope that i have posted this in the right place. The key to understanding Daniel 12 is the context. When would Daniel 12 be fulfilled? Daniel 12:1 begins, “Now at that time…” This points to the same time period of the verses preceding it. Since Daniel 11 speaks of the kings to the North and South (widely recognized as the Seleucid and Ptolemaic empires), Daniel 12 would be fulfilled during the time of the Greek Empire, rather than in the later Roman Empire, as many suppose. That Daniel 12 speaks of the Greek era is confirmed in Daniel 12:11-12, which deals with the cleansing of the altar that had previously been desecrated under the Greeks, and the restoration of the daily sacrifice (compare Daniel 12:11-12 with Daniel 11:31-35). 1 Maccabees records the historical fulfillment of Daniel 12. Since Daniel 12 is fulfilled in the second century BC, Daniel 12:2 cannot be referring to a literal resurrection. Daniel 12:2 refers neither to the supposed “spirit resurrection” in 70AD as believed by the heretical hyperpreterists, nor does it refer to the still future resurrection as taught by orthodox Christianity. Daniel 12:2 uses resurrection as a metaphor to depict the spiritual revival that occurred during the Maccabean period. The wickedness of Antiochus Epiphanes IV and his attempt to destroy the Jewish religion divided the Jews into two groups: those that were faithful to the Mosaic Covenant, and those who rejected it for paganism. As 1 Maccabees makes clear, those Jews who were faithful to the Covenant were ultimately successful and went down as heroes, whereas the Jewish traitors will forever be looked down on with contempt. Hebrews 9:28 informs us that Jesus will appear a second time. What is this second appearance of Christ? As many correctly point out, the first coming of Christ was in the flesh, so it stands to reason that the second coming of Christ will likewise be in the flesh. Even so, there are some who claim the second coming of Christ happened in 70AD, with the destruction of Jerusalem. The first problem with this view is the second coming is to be in the flesh, and Jesus did not return in the flesh in 70AD. The second problem is that 70AD can in no way be considered Jesus’ second coming. Jesus comes in judgment many times throughout history, whether it be against individuals, churches, or nations. According to Matthew 18:15-20, especially verse 20, dealing with church discipline, Jesus says He comes in judgment every time church discipline is practiced. Thus, for the recipient of such discipline, Jesus comes in judgment against him. From 1 Corinthians 5:1-13 and 2 Corinthians 2:6-11, we know that church discipline was practiced at least once prior to 70AD. Since that was an instance of Jesus coming in judgment against an individual (who later repented and was restored), that would make Jesus’ 70AD coming at best His third coming. So the second coming of Christ in Hebrews 9:28 cannot be referring to 70AD. In context, the writer of Hebrews is pointing out Christ’s superiority over the Levitical system. They offer the sacrifice on the Day of Atonement year after year, whereas Jesus offered Himself as the atonement for the forgiveness of sins once for all time (Hebrews 9:25-26). The Hebrews writer compares Jesus to the fate of man at the final judgment, because Jesus has already experienced the resurrection that the rest of mankind will partake in at the final judgment. For Jesus, “having been raised from the dead, is never to die again” (Romans 6:9). So the second coming of Christ as mentioned in Hebrews 9:28 must refer to the still future final judgment, when both the righteous and the wicked will be raised up. (This is NOT to say that the righteous and the wicked will receive the same kind of resurrection; they will not. But both the righteous and the wicked will be immune to physical death, making their final outcomes permanent). The Chart that you posted with the 483 years until Christ is the doctrine of the Seventh Day Advents as they say that the 490 year prophecy ended with the stoning of Stephen in 34 Ad. They say nothing of when the city and the temple was destroyed . and I can find no time listed in the bible as to when Stephen was stoned. So the chart would be invalid as too bible prophecy. I remember Now where the Chart is located It is in the book what seventh day Adventist believe. one of their books . They claim that the 490 year prophecy of Daniel 9 ended 34AD. The Chart shows Christ Crucifixion in the year of 31 AD. If you go to the website timeanddate.com you can check for the Isreal calender for that year. Christ was crucified in the first Jewish month on Nisan 14th . This is when the Passover lamb was to be killed. In the year of 31AD that was on a MONDAY. The Chart is invalid and the year of 457 BC in which they start the count, Is the wrong year with the wrong king in which to began counting until the Messiah would appear. Thanks for the info. I didn’t realize that Seventh Day Adventists hold to the no-gap, past fulfillment viewpoint (that the 70 weeks ended in 34 AD with the stoning of Stephen). Interestingly enough, they basically agree with Martin Luther (see my second comment under this post), although Luther didn’t specifically mention Stephen or the year 34 AD. You’re right. The Bible doesn’t tell us in what year Stephen died, or how soon after Christ’s ascension that this took place. For those who place Stephen’s death in 34 AD, I don’t know if they’ve received this information from a historic source like Josephus or if this is someone’s speculation. I call this one large week. I do hope that the charts that I have made below will help in understanding about how to count the time. http://www.answers.com/topic/darius-ii-of-persia Babylonian tablets from Nippur; here effectively the reign of Darius II follows immediately after that of Artaxerxes I. Here is the beginning of an article I wrote that touches on this topic. Before I leave Revelation 13, I want give a brief refresher on the time period of three-and-a-half—the time of trial right before the Second Advent. This brings together some things that I covered in more detail in volume I. The last half (3 ½) of Daniel’s seventieth week: Daniel 9:27. A time (and) times and half a time (a time period of three-and-a-half): Daniel 7:25; 12:7; Revelation 12:14. Forty-two months (three-and-a-half years): Revelation 11:2; 13:5. 1260 days (forty-two months of 30-day months): Revelation 11:3; 12:6. Three-and-a-half days: Revelation 11:9, 11. The primary source for the time of trial of three-and-a-half is the seventy weeks of Daniel 9:24-27. The context of the seventy weeks—literally seventy sevens—has to do with the Jews and Jerusalem (“Seventy weeks are determined for your people and for your holy city . . .” Dan 9:24; cf. Rev. 11:2). The time period of three-and-a-half is the last half of the seventieth seven. In considering this time period, it is helpful to look at Daniel 9:26-27; these two verses present a juxtaposition of the activities of Christ and Antichrist. 26. [Christ] And after the sixty-two weeks Messiah shall be cut off, but not for Himself; [Antichrist] and the people of the prince who is to come shall destroy the city and the sanctuary. The end of it shall be with a flood, and till the end of the war desolations are determined. 27. [Christ] Then he shall confirm a covenant with many for one week; but in the middle of the week He shall bring an end to sacrifice and offering. [Antichrist] And on the wing of abominations shall be one who makes desolate, even until the consummation, which is determined, is poured out on the desolate. 26. And after the sixty-two weeks Messiah shall be cut off . . . .
27. . . . in the middle of the week He shall bring and end to sacrifice and offering . . . . The death of Jesus brought an end to the legitimacy of the sacrificial system (cf. Matt. 27:50-51; Heb. 10:11-18); it happened after seven and sixty-two weeks, Dan. 9:25 (i.e., during the seventieth week, at the end of its first half). 26. . . . and the people of the prince who is to come shall destroy the city and the sanctuary. The end of it shall be with a flood, and till the end of the war desolations are determined. 27. . . . And on the wing of abominations shall be one who makes desolate, even until the consummation, which is determined, is poured out on the desolate. It is this last half of Daniel’s seventieth week that the time period of three-and-a-half is referencing. In the middle of the seventieth week, the Christ would be cut off and then the Antichrist would come make the Jewish nation desolate (cf. Dan. 12:7). The last half of the seventieth week can thus be seen as either the time from AD 30 (when the Messiah was killed) to AD 70 (the defeat of the Antichrist) or as a three and a half year bookend at the conclusion of the seventieth week (Jesus’ three-and-a-half year ministry at the beginning of the seventieth week being the other bookend). I refer to these two variations as the literal and symbolic uses of this time period. My husband just discovered this blog and shared it with me. I am the one who introduced him to the preterits view of scripture. I was a dispensationalist, The church I attended after I became a Christian at the age of 21 was a Plymouth Brethren Church. The Plymouth Brethren are a direct descendant of the teachings of Darby dispensationalists. I never questioned their futuristic views until someone challenged me to defend them biblicalily. I could not. And after I saw that the Bible could be understood literally in the context of the time it was written, it all came alive to me. As far as the last week in Daniel’s 70 week prophecy I believe that the last 3.5 years ended with Peter’s vision and his going to preach to the gentiles Acts 10. Anyway this may be interesting to you. About 4 years or so ago I questioned someone who was on the translation committee of the TNIV (Today’s New International Version ) I will copy and paste our communication. I don’t have the original question that I wrote, but i was wondering about the phrase, “on the wing of abominations” which is used in the KJV and other standard translations. In the NIV (1984) the phrase read; (27 He will confirm a covenant with many for one ‘seven.’[i] In the middle of the ‘seven’[j] he will put an end to sacrifice and offering. And on a wing of the temple he will set up an abomination that causes desolation, until the end that is decreed is poured out on him.) It is obvious that the NIV forced an interpretation instead of making a translation. Thank you for contacting International Bible Society regarding the translation of Daniel 9:27. It is a mind-boggling problem in translation. The Hebrew does indeed have the word for “wing”, but the “of the temple” phrase had to be supplied in the NIV, since it is not in the best Hebrew text. They assumed it obviously meant a “wing of the temple.” Actually there is some ground for adding “of the temple”: it’s found in the Septuagint! Thus the TNIV opts for the Septuagint rendition and has “And at the temple he will set up an abomination that causes desolation” instead of rendering the word “wing”. In that way the passage seems more understandable, as you suggest. I’d say the Septuagint translators faced the same issue that you did, and couldn’t figure out what to do with that pesky word “wing.” Clearly the temple was being referred to, so they felt justified in rendering it that way. Actually, you are the first person to bring this construction to my attention. Thanks for alerting us to it at this time. I’ll continue to research it. Thank you so much for your response to my question. Now I understand where the reference to the temple comes from; the Septuagint, and that makes sense they would think of the temple as they were doing their translation. But what if they were mistaken as to what was being referred to, they were not the inspired writers. I think it makes more sense that the Anointed One is the “He will confirm a covenant with many for one ‘seven.’ In the middle of the ‘seven’ he will put an end to sacrifice and offering.” Jesus’ ministry, death and resurrection confirmed the New Covenant After that the sacrifice and offering would cease to mean anything. The last three and a half years the disciples preached in Jerusalem and were persecuted and went to the gentiles. The abomination that causes desolation was rejecting Jesus after He rose from the dead! You may not agree with my interpretation but I’m sure you can grant me it is a valid one, especially if you have to add a phrase that isn’t there “of the temple” and take away a word that is “wing”. I know the International Bible Society wants its translation to be as accurate as possible. Of course since i am the only person to have questioned this it doesn’t matter. I believe that “on the wing ” is a figure of speech meaning that the abomination of rejecting Christ brings on the desolation. Thanks so much for sharing your story about leaving behind dispensationalism and coming to the preterist view, and also for sharing about your exchange with the committee of the TNIV. Good for you for having that conversation with them. It’s interesting to see what was said in that exchange, and I learned something as well about the added phrase “of the temple.” It seems that your view of the phrase “on the wing” is very similar to John Calvin’s view, quoted in the post above. When I read this verse I don’t see two people mentioned, I see one. I believe the 70th week ended 3 1/2 years after the cross. Probably when Peter saw Cornelius. I believe these abominations are referring to the abominations against Christ during his trial and crucifixion. If you read in Proverbs all the verses identifying what abominations are you will see some of them lining up with what happen to Christ. Matt 23:38 and Luke 13:35 has Christ announcing how their house will be left desolate. When Christ died and the veil was torn in two, I believe is the time when “he” (Christ) shall make it(The temple) desolate. The “consummation” is when the temple is destroyed in 70 A.D. The Old Covenant is gone only the New Covenant remains, Heb 8:13. The abomination of desolation Christ mentions concerning the surrounding armies, I believe he is referring to Daniel 12. Tammy, thanks for sharing your thoughts. What you wrote is thought-provoking for sure. I would agree that the opposition against Christ was part of the abominations mentioned in Daniel 9:27, especially in light of the parables Jesus told about how those who put Him to death would be judged. I also believe that it’s no coincidence that Jesus used the word “desolate” in Matthew 23, and that the same word already appeared in Daniel 9. I realize this post of Adam’s is an older one, but if I may, I would like to add some details to the discussion of the dates for the four decrees. I may have missed it, but so far I haven’t seen anyone making a reference to Bishop Ussher’s work, “Annals of the World”, with regard to the dates assigned to each of these four decrees by the Persian kings. While reading Ussher’s 1658 history, I noticed that he had long ago offered a simple solution that clears up the confusion of dating this 70 weeks prophecy of Daniel’s. Apparently, the majority of the confusion relates to finding the exact date for the beginning of Artaxerxes I’s reign, which would determine what date is assigned to the last two decrees, given in the seventh and the twentieth year of his reign. I am in unity with the few who have already commented that there is no gap whatever from start to finish of this 490 years of prophecy. I find it impossible to see that “SEALING UP the vision and prophecy” has anything to do with the later UNSEALING of all the decreed desolations when they are poured out in the AD 66-70 judgment on Judea and Jerusalem. As John Evans says in his book, “The Four Kingdoms of Daniel” (p.364), “…I accept the idea that 490 years were allotted to the Jewish people for the completion of the Old Covenant and that, with their rejection of Jesus, they locked into place the outcome that Jesus had prophesied for them as destined to occur within ‘this generation’ (Matt. 24:34).” I, too, find that there is a clear division between the six prophetic phrases of the 70 weeks prophecy in Daniel 9:24 and the days of vengeance when punishment was finally poured out on that generation. So, according to Bishop Ussher’s calculations in his “Annals of the World”, we need to make a critical adjustment to the generally-accepted dates for the last two decrees by Artaxerxes I. Ptolemy’s Canon is most often used to determine the dates for these decrees. However, Ussher noted that Ptolemy’s record of Artaxerxes I’s reign was mistaken in one respect when he proposed a 464 BC beginning for this – he did not take into account the fact that Artaxerxes I had actually shared a vice-regency with his father Xerxes I for a NINE YEAR PERIOD starting in 474 BC. This creates an overlap of their two reigns, and shuffles the dating for the events of Daniel’s 70 weeks prophecy. The resulting dates for a terminus a quo and a terminus ad quem can then be used to point directly to the manifestation and redemptive work of Jesus Christ the Messiah and the labor of His apostles among Daniel’s people. 454 BC – This is the year of the 4th decree in Nehemiah 2:1, given in the 20th year of Artaxerxes I’s reign (including his nine-year viceroy relationship with Xerxes I, which started in 474 BC). This decree consisted of letters from Artaxerxes I given to Nehemiah, which included explicit directions to provide materials for building the walls of Jerusalem. Much of Nehemiah’s record of events was devoted to the details of the wall’s construction and its final dedication ceremonies. (Personally, I particularly enjoy reading the part in Nehemiah 3:12 where the daughters of Shallum gave their father a helping hand at repairing his section of the wall.) This wall was specifically brought into prominent mention as a fulfillment of the decree in Daniel 9:25, including the “troublous times” during its construction. AD 30 – This year represents the end of the 69 weeks (or 483 years). It is fulfilled, NOT AT JESUS’ BAPTISM, (which was in AD 27), but 3 years later when His public, miraculous ministry started. Ussher presents a 3-year novitiate period for Christ from the time of His baptism and wilderness temptation by Satan in AD 27, when Satan left Him “for a season” (of 3 years), up until the year Christ performs His first miracle at Cana in AD 30, causing His disciples to believe in Him. A careful comparison of the gospel accounts will show that this period of time between his baptism and the first miracle he performed in Cana does exist. John the Baptist himself (who did no miracles) emphasized the transition to Christ’s miraculous ministry with his well-known statement of self-abasement in John 3:30 – “He must increase, but I must decrease” (spoken in AD 30). John is shortly thereafter, (also in AD 30), cast into prison by Herod. Mark 1:14-15 has a record of Christ’s words just after this imprisonment of John the Baptist, saying that “The time (season) is fulfilled, and the kingdom of God is at hand; repent ye and believe the gospel.” This “fulfilled season” was an announcement that the first year of Daniel’s 70th covenant week for Israel had begun. Christ also made an announcement that the covenant week had already begun as He stood up to read the Isaiah prophecy in the Nazareth synagogue in AD 31. “The acceptable year of the Lord” that He referred to in Luke 4:18-21 was none other than the predetermined beginning of Daniel’s 70th week. On this very occasion, Christ spoke of His being anointed by the Holy Spirit at His baptism in order to preach the gospel. This is the “anointing of the Most Holy” that was included in the list of 6 distinguishing marks of the prophecy in Daniel 9:24. This “anointing” of Christ at his baptism would have been the equivalent of our modern-day “election” of a candidate, with an inauguration coming later to install the person officially in their office (which would have been 3 years later in AD 30 for Christ’s public ministry). AD 33 – This was the middle of Daniel’s 70th week, at Passover, when Christ was “cut off out of the land of the living” and ascended to His Father. Ussher confirms this as the crucifixion year by bringing forward several historians’ accounts which mention a famous eclipse of the sun in AD 33, matching the time of the one which occurred at the crucifixion. For the previous 3 and 1/2 years, Christ’s ministry on earth had been concentrated mainly on “the lost sheep of the house of Israel” (Matt. 15:24). This “confirming of the covenant” with Daniel’s people continued (without a gap) for another 3 and 1/2 years afterward by the ministry of the apostles. Again, evangelization was concentrated mainly to the Jews, as Acts 11:19 says of those who were scattered abroad in the persecution following the stoning of Stephen. 3 and 1/2 years of the 70th week.) This “woman” is definitely identified with ethnic Israel – crowned with 12 stars, clothed with the sun, and with the moon under her feet – all of which are a reflection of Joseph’s dream of sun, moon, and stars representing Jacob and his family. Saul’s part in persecuting the early church was included in the “flood” which the dragon cast out of his mouth, trying to overcome the fleeing woman. Following Stephen’s martyrdom, this dispersion of the persecuted saints into the regions of Judea and Samaria only served to accomplish the commission Christ had given the disciples, and multiplied the number of believers. Ussher places Saul’s/Paul’s conversion in AD 35. The setup for Paul’s ministry is remarkably similar to Christ’s. First, an anointing by the Holy Spirit at his baptism, as Ananias was directed by God to perform. Next, Paul is sent to Damascus and Arabia for a period of approximately 3 years, during which time he received one-on-one revelation by God Himself. Just as Christ did during His 3-year novitiate period, Paul also preached in the synagogues of Damascus, establishing proof of a consistent testimony as God’s representative. Again, just as the Jews rejected Christ’s words in the Nazareth synagogue and cast Him out of the city, attempting to throw Him over the hill, Paul similarly raised the wrath of the Jews against himself in AD 37, and he had to be let down the wall of Damascus in a basket to escape the Jews’ plots to kill him. AD 37 – This is the year which wraps up the 3 and 1/2 years of confirming the covenant with many of Daniel’s people. After Paul’s escape from Damascus in AD 37, he traveled to Jerusalem to finally meet Peter, James, and Barnabas (Gal. 1:15-19). It was at this time that he visited the temple and fell into a trance as he prayed (Acts 22:17-21). Christ essentially gave Paul his marching orders during this vision, saying, “Depart: (from Jerusalem) for I will send thee far hence unto the Gentiles.” This is God Himself announcing the close of Daniel’s 70th week. The Jews had stopped their ears at Christ’s words in the Nazareth synagogue and tried to kill Him at the beginning of Daniel’s 70th week. They stopped their ears during His entire 3 and 1/2 year ministry, and finished by crucifying Him in AD 33. They then stopped their ears when Peter and the apostles testified before them, by taking counsel together to kill them, and were barely restrained from doing so by Gamaliel’s advice. Stephen’s words of testimony also fell on deaf ears, and his martyrdom was the result. The testimony of a converted Paul in AD 37 at Damascus brought on the same desire to kill him for his witness (Acts 9:22-23). Shortly after that, in Jerusalem, Paul’s boldness in the name of Christ brought the identical response (Acts 9:29). God’s longsuffering towards Daniel’s people had ample opportunity to display itself during this entire 70th week. Though the covenant had been confirmed with many of them (the remnant of Daniel’s people), the greater majority had refused the offer and had “judged themselves unworthy of everlasting life” (Acts 13:46). Paul was finally “inaugurated” as God’s chosen vessel at the close of this 70th week, and commissioned to concentrate his energies on evangelizing the Gentile world, just as God had predicted to a skeptical Ananias in Acts 9:15. For those who are reluctant to consider this occasion of Paul’s AD 37 vision in the temple as sufficiently dramatic to wrap up this grandiose prophecy of Daniel’s 70 weeks of years, check the words of Paul in I Timothy 1:15 (Interlinear). Essentially, Paul is explaining to Timothy that God deliberately chose him, with his high-profile reputation as a persecutor and an enemy of the faith, to be “THE FIRST” one of a particular group of sinners. He was to be a “PATTERN” exemplifying all the formerly alienated Gentiles who were “ABOUT TO BELIEVE” on Christ (after the 70 weeks prophecy devoted to Daniel’s people had expired). He goes on to say in I Timothy 2:6-7 that God had ordained him as a “HERALD” , to go before and announce the gospel to the Gentiles and to teach them, once the “due season” had come. Paul himself was no Gentile, but by his initial, violent hatred of Christ and His followers, he provided the perfect type that illustrated the condition of the alienated Gentile class before he (and they) were dramatically converted by the light from heaven. As brought out by Ralph Woodrow in Adam’s original post, Paul and Barnabas had said to their fellow-countrymen, the Jews, in Acts 13:46 (and Peter in Acts 3:25-26) that “It was NECESSARY that the Word of God should FIRST have been spoken to you:” It was necessary, because it was decreed by Daniel’s 70 week prophecy that the Jews would have one last, complete covenant week from AD 30-37 to respond to Christ’s offer, before Paul’s and others’ missionary efforts were expanded to include the nations – which revealed the glorious mystery of the “One New Man”.